With the recent advances in immunosuppressive treatment, the survival rate of renal grafts after transplantation has markedly improved. However, there are problems that await resolution regarding the side effects of the immunosuppressive agents; for example, the high incidence of side effects of calcineurin inhibitors, such as glucose intolerance, renal dysfunction, hyperkalemia, and tremors. There are very few reports of rhabdomyolysis, which may be a rare adverse drug reaction. , We report our experience of a case with mild rhabdomyolysis that might be associated with the use of calcineurin inhibitors. A 37-year-old man on hemodialysis for 2 years due to membranoproliferative glomerulonephritis (MPGN) underwent a living renal transplantation donated by his mother at our hospital. There was an ABO blood group mismatch from type O to type A. The investigations before transplantation were unremarkable. Induction immunosuppressants included tacrolimus, mycophenolate mofetil (MMF), steroids, and chimeric CD25 monoclonal antibody. The course of the patient during the first three weeks after transplantation was uneventful, and serum creatinine reached acceptable values (around 1.5-2.1 mg/dL). However, 25 days after the operation, the patient suddenly developed severe precordial pain and appendicular muscle pain. The muscle pain in the quadriceps femoris was severe bilaterally. Laboratory investigations revealed an increase in the serum creatine phospho-kinase (CPK) level to 1,437 IU/L with a marked increase in urinary myoglobin levels [Figure 1]. Figure 1: Sequential changes of serum creatinine (s-Cr), LDH and CPK. The postoperative course after the transplantation. His postoperative course to 24 days was very good and serum creatinine level reached excellent values (around 1.5– 2.1 mg/dL) and the amount of urine protein was around 0.1– 0.2 g/day. However, 25 days after transplantation, laboratory data showed a marked rise in serum CPK, and urinary myoglobin also increased remarkably when muscle pain occurred. The serum creatinine passed by about 1.5– 2.2 mg/dL and did not show remarkable deterioration even after the onset of rhabdomyolysis. On the same day, there was an increase in other transaminases [aspartate transaminase (AST) 60 IU/L, alanine transaminase (ALT) 47 IU/L and lactate dehydrogenase (LDH) 244 IU/L]. The urine became dark with a rise of myoglobin level to 730 ng/mL. Serum trough level of tacrolimus increased to 13.6 ng/mL. Elecrocardiography and chest X-ray showed no abnormal findings. We attributed rhabdomyolysis to tacrolimus and switched over to cyclosporine (CYA). In addition, we switched over from MMF to azathioprine (AZ) at the same time. The serum CPK value began to decrease 4 days after the changes made in the immunosuppressive agents administered. However, serum CPK and urinary myoglobin began to rise again and mild muscular pain also reappeared. Then, we started administering CYA three times a day instead of two times that was followed earlier, although the total daily dosage was not changed. The serum CPK value normalized again after the change made in the administration method. A protocol biopsy obtained on day 17 after transplantation showed a recurrence of MPGN. We came to know this result on day 31 after transplantation, and then made a decision to strengthen the immunosuppression. So, we had to re-start tacrolimus instead of CYA. The initial total daily dosage was 3 mg, which was divided and given three times a day. The dosage was then gradually raised to 6 mg/day, and MMF was also restarted. The clinical symptoms, such as muscle pain, had almost disappeared 50 days after the operation. Tacrolimus serum levels reached 6.0-8.0 ng/mL postoperatively, but increased to a peak value of 13.6 ng/mL when the muscle pain developed. Therefore, when tacrolimus was restarted, we attempted to maintain the serum trough level at a relatively low level of around 5.0-7.0 ng/mL [Figure 2]. He left the hospital 66 days after transplantation, and rhabdomyolysis did not recur on follow-up. 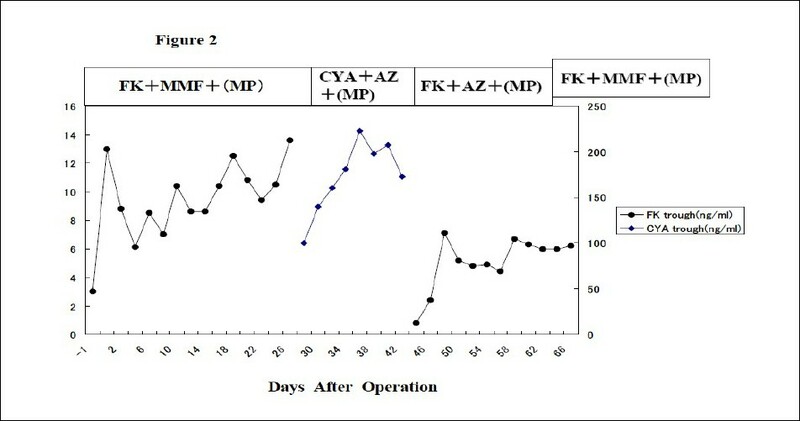 Figure 2: Sequential changes of FK and CYA trough level. As to the tacrolimus concentration through the clinical course, it reached 6.0– 8.0 ng/mL postoperatively, but increased to a peak value (13.6 ng/mL) when the muscle pain developed. The causes of rhabdomyolysis are divided into three types. The first involves external injury caused by a bruise or frostbite. The second is a non-traumatic cause such as genetic or metabolic disease. Finally, miscellaneous etiologies such as infectious diseases, medications, and hyperthermia can cause rhabdomyolysis. Unfortunately, the detailed mechanisms underlying the pathogenesis of rhabdomyolysis are not clear. In general, lack of oxygen to the muscle cells and the use of excessive energy within them result in the production of metabolic toxins which cause rhabdomyolysis. A rapid identification of the cause of rhabdomyolysis is important as any drug suspected to induce rhabdomyolysis should be discontinued. Adequate fluid therapy and diuresis are also essential. When necessary, hemodialysis and plasmapheresis should be applied. According to Demirbas,  the frequency of rhabdomyolysis accounts for only 0.8% of all side effects caused by calcineurin inhibitor. We found two case reports on rhabdomyolysis in which tacrolimus administration was regarded as a direct cause. , In the first case, the patient died the day after the appearance of clinical manifestations. In contrast, the second patient received plasmapheresis and continuous veno-venous hemofiltration promptly, after the symptoms first appeared; furthermore, the immunosuppressive agent was changed from tacrolimus to sirolimus at the same time, and as a result, the patient recovered. In our case, we did not apply plasmapheresis. In conclusion, from this case, we believe that the use of calcineurin inhibitor increases the risk for rhabdomyolysis, and changing the method of administering calcineurin inhibitor to three times a day maintained the trough levels constant, which may have resolved the problem. To Barbara Levene for her English editing of this report. 1. Demirbas A, Tuncer M, Yavuz A, et al. Influence of tacrolimus plus mycophenolate mofetil regimens on acute rejection rate and diabetes mellitus development in renal transplant recipients. Transplant Proc 2004;36:175-7. 2. Atkinson P, Joubert G, Barron A, et al. Hypertrophic cardiomyopathy associated with tacrolimus in paediatric transplant patients. Lancet 1995;345:894-6. 3. Hibi S, Misawa A, Tamai M, et al. Severe rhabdomyolysis associated with tacrolimus. Lancet 1995;346:702. 4. Gabow P, Kaehny W, Kelleher S, et al. The spectrum of rhabdomyolysis. Medicine 1981; 61:369. 5. Fontana I, Ginevri F, Basile G, et al. Severe rhabdomyolysis and acute renal failure in a kidney transplant patient treated with tacrolimus and chimaeric CD 25 monoclonal antibody. Transplant Proc 2004;36:711-2. Scarfia, R.V. and Clementi, A. and Granata, A.